Extra Heavy Set bandsaw blades are equipped with heavy-set teeth that provide extra blade clearance. This minimizes binding or pinching when beam stresses are relieved and/or when bundles move during cutting. Because of its tooth geometry, EHS blades reduce vibration and noise levels, providing for smoother finish and the prevention of chipped and stripped teeth. EHS are the types of blades preferred in structural cutting applications and are specially designed for cutting H- and I-beams and structural steels that have a tendency to close in on a cut. They are also excellent for use by steel fabricators, production cutting houses, and steel service centers. Extra Heavy Set bandsaw blades range from 1-1/4” to 2-5/8” in width, and an 8% cobalt high-speed steel edge assures longer blade life. EHS-type saw blades work well with positive tooth rake angles to produce faster cutting rates and are heat and wear resistant. The heavy set teeth provide extra blade clearance, assuring minimized binding or pinching when beam stress is relieved or when bundles move during the cutting process. The tooth geometry will allow for faster cutting rates and increased productivity. There is also less noise being produced. The IC Heavy Set bandsaw blade is the smart choice for bundle and structural cutting applications and is the only saw blade recommended for beam cutting. The IC bi-metal saw blade is designed to cut bundle solids, structural steel, tubes, and small solids. It can handle large cross-section structural materials while avoiding blade pinch during the cutting process. The IC Heavy Set features a custom HSS bi-metal blade design to maximize cutting performance while minimizing kerf loss. It will outlast the old style matrix bands by up to 20%, making short work of all the bundle and structural cutting. Due to the special engineering of the IC Heavy Set blade, there is a guarantee of a smoother finish, and a smooth finish means a longer blade life. 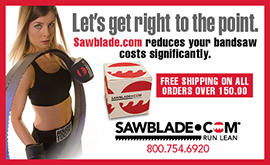 Visit SawBlade.com to discover more about the IC Heavy Set Bi-Metal bandsaw blade. This entry was posted in All Posts and tagged #bandsaws, #SawBlades, Bandsaw, blades, EHS, IC Heavy-Set, machines, machinists, saw, sawblade.com, woodworkers. Bookmark the permalink.